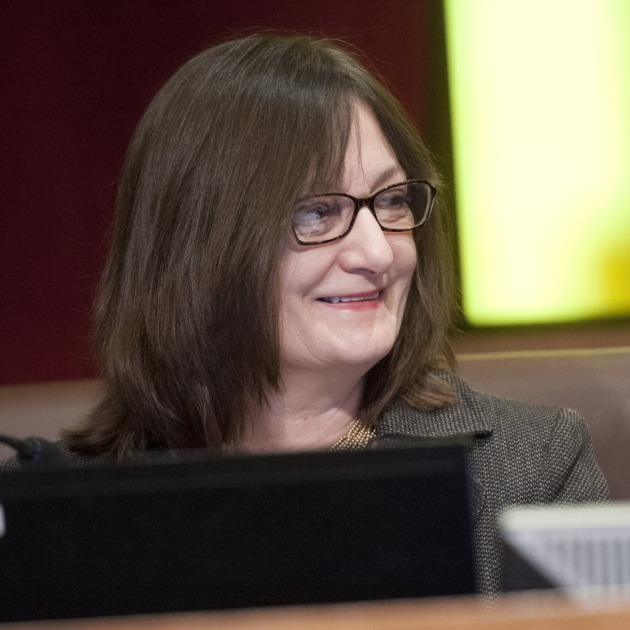 One of the longest-serving members of the current City Council, Sandy Colvin Roy, said Monday night that she would not continue seeking re-election. The announcement is among the most surprising developments of the 2013 city election cycle. Colvin Roy, who was elected to the council in 1997, has held the office longer than any of her colleagues except council president Barb Johnson -- elected in the same year. The DFL did not endorse in Colvin Roy's southeastern ward, largely due to the aggressive campaign of neighborhood organizer Andrew Johnson. Johnson attributed the non-endorsement to Colvin Roy's support of the Vikings stadium without a referendum. He is still pursuing the seat along with Green Party candidate Chris Lautenschlager. Colvin Roy, who chairs the city's transportation committee, was the crucial swing vote who secured passage of the Vikings stadium bill -- a deal that divided the normally unified body. After initially saying it should be put to a vote, she later supported the proposal after the city attorney said a referendum was not required under the charter. Her decision means the 2014 council is guarranteed to feature even more new faces, following an election year marked by anti-incumbent sentiment. Three seats are already open because their representatives are running for mayor, and the DFL has endorsed challengers over incumbents in three other races. In a letter to supporters posted on Facebook, Colvin Roy said stepping aside was in the best interest of her family and the ward. "Each of the four elections I have been engaged in has been hotly contested," Colvin Roy wrote. "I have won them all and the campaign this year is no different. I could run and win." She said she would look forward to gardening, being home for dinner and walking around in public without being stopped about city issues. "Most of all, I look forward to not having my motives and intent attacked whenever I make a decision," Colvin Roy wrote. As chair of the transportation committee, Colvin Roy is the council's point-person on public works issues, including road repavement, garbage pickup, transit projects, traffic congestion and sewer improvements. Responding to the news Monday night, Johnson praised Colvin Roy's accomplishments in a note to supporters. "I am happy to have had the chance to work with her and know that she has done many good things for all of us over her tenure, from working on the light rail and environmental issues, to addressing airport noise and rolling out single-sort recycling," wrote Johnson, who is president of the Longfellow Community Council. Colvin Roy will serve out the rest of her term, which expires at the end of the year.